Remember you can get Nuacht and Nuacht Eile delivered each day by email by clicking both the Nuacht and Nuacht Eile email subscriptions links on each site. Both Nuacht sources are also available by "liking" us on Facebook or "following" us Twitter. Maith sibh a pháistí nár chaill aon lá scoile i mbliana! Maith sibh a pháistí nár chaill aon lá scoile i mbliana. Well done to the children who had full unbroken attendance this year. Seans gur chuala sibh nár bhain na páistí árd-taitneamh as an turas scoile go dtí an Mardyke i mbliana. Rinneamar gearán faoi sin agus tá áthas orm a rá gur eirigh linn cuid den gcostas a fháil ar ais uathu. Uaidh sin táimíd ag ceapadh go mbeadh sé deas turas eile a eagrú dóibh i Mi Mean Fomhair nuair a thagann siad ar ais ag úsáid an t-airgead a shábháileamar. Seans go mbeidh costas beag breise ar an mbus ach ní morán a bheidh ann ní dóigh liom. Guím samhradh iontach dos na páistí iontacha agus daoibh ar fad! I'm sure you all are aware that this year's 4th & 5th class school tour to Mardyke wasn't everything we had hoped it would be. There was no major incident or anything but we felt the activities were inappropriately "young" for our group. We made a complaint and they are happy to refund most of the cost of the tour. I think it would be nice to spend this money on a different activity/tour for that group in September. They were exceptionally well behaved and polite on the day and it will be nice to treat them. There may be a small cost for the bus etc but we'll see iin September and I'm sure it won't be too much. I wish all our wonderful children and you a lovely summer break! Fé mar is eol daoibh ar fad beimíd ag críochnú suas amárach, 27/06/'14, do laethanta saoire an tsamhraidh. Beidh na naí-ranganna (& deartháireacha & deirfiúracha níos sinne) le bailiú ag 12.00 meanlae agus ranganna 1-5 le bailiú ag 12.15. Beidh muintir an bhus ag críochnú ag 12.00 chomh maith. Mar is gnách, beidh lá spraoi ag na páistí amárach. Tá cead acu 2 rud beag a bhreith leo ar scoil chomh maith le bréagáin. Mar i gconaí níl cead acu leithéidí iPad srl (nó aon bréagáin ró-chostasach) a bhreith leo ar eagla go mbrisfí iad. Ní féidir leis an scoil a bheith freagrach as aon damáiste nó dochar a d'fhéadfadh tárlú ar scoil d'aon bréagán a thabharfar isteach mar sin molaim daoibh a bheith coinsiasach faoi sin! As you are all aware we will be finishing up tomorrow 27th June '14 for the summer holidays. The junior classes, along with their older brothers and sisters, should be collected at 12 noon and classes 1-5 should be collected or will be free to go from 12.15. The children that take the bus will be free to go from 12.00 also. As usual at the end of term, the children will have a fun day at school. They may bring 2 small treats as well as a toy to play with. As always they are not permitted to bring in expensive iPad type toys and I would ask you to be very conscious of the fact that the school will accept no responsibility for any damage or breakages when you are choosing which toy to bring in! Tá trádaire bácála fágtha ón díolachán cácaí. Más leatsa é, téir i dteangmháil le múinteoir Siobhán Ní Bhruacháin. One baking tray has not yet been collected since the cake sale. If you are missing this baking tray contact Múinteoir Siobhán Ní Bhruacháin. Rinne cúpla páiste i Rang a 1 agus i Rang a 2 taighde sa bhaile ar na tíortha éagsúla atá ag glacadh páirt i gCorn an Domhain. Is féidir libh na grianghrafanna a fheiscint ar suíomh na scoile anois. Some 1st and 2nd class pupils conducted research at home on the countries that are participating in the World Cup 2014. You can view some photos of their work on the school website. Mar chríoch don obair faoin bhfarraige á dhéanamh ag rang a ceathair beidh siad ag siúl chuig an siopa éisc 'Crafty Cod' amárach an Céadaoin an 25/6/14. Beidh suirbhé á dhéanamh ag na páistí ar na héisc ann. Má tá am againn tar éis déanfaimid píosa beag gan cnámha a cócairáil is a bhlaiseadh thar n-ais ar scoil. To finish up a year long sea project, fourth class will walk to the Crafty Cod fish shop tomorrow 25/6/2014 . There they will carry out a survey on the fish for sale. Time etc permitting we may then cook and taste a small bit of fresh de-boned fish when back in school. Tá foireann iománaíochta Rang a 3/4 agus Rang a 5 ag glacadh páirt i gcluichí cheannais amárach, Dé Máirt (24/06/2014) ag tosnú ag a 10.00am. Beidh an comórtas Poc Fada ag tosnú i ndiaidh iad san ag a 11.00a.m. Beidh Donnacha Ó Deasúnaigh (R4) agus Ellie Condúin (R5) ag glacadh páirt ann ar son na scoile. Go n-éirí libh ar fad!!! Tá fáilte roimh gach éinne a theastaíonn uatha teacht chun tacaíocht a thabhairt dóibh thíos ag an Páirc CLG i gCionn tSáile. 3rd/4th class and 5th class school hurling teams will be taking part in the local school hurling finals tomorrow, Tuesday (24/06/2014) starting at 10am. There will be a Long Puc competition after these, at 11.00am. Donnacha Ó Deasúnaigh (4th class) and Ellie Condúin (5th class) will be the school representatives in this competition. Best of luck to all our teams and individual players. Anyone who wishes to come to the GAA pitch in Kinsale at these times, to show their support are more than welcome. H'on Gaelscoil Chionn tSáile!!! Céan míle buíochas ó Rang 4 do ghach uile dhuine a thug tacaíocht dúinn leis ár ndíolachán cácaí ar son UNICEF. Bhailíomar €521 is dá bhrí sin, gheobhaidh 5210 páistí instealladh i gcoinne polio. Nach iontach é sin! Buíochas arís. A sincere thank you from fourth class to everyone who supported their cake sale for UNICEF. We collected €521 which means 5210 children will now receive a vaccine against polio. We are thrilled. Thank you again. Gabhaimid buíochas libh go léir a thacaigh leis an ocáid tiomsaithe airgid "Bob a Job" le déanaí. Cruimmíodh €1,200! Úsáidfear cuid den airgead seo chun trealamh imeartha nua a cheannach don chlós Mí Mheán Fómhair seo chugainn. Bhuaigh na Naíonáin Shínsearacha an duais i gcóir an cuid is mó bob a jobs déanta acu agus gheobhfaidh siad rud beag an tseachtain seo chugainn. Maith sibh agus go raibh míle maith agaibh arís. Thanks to everyone who supported our recent Bob a Job fundraiser . We raised an incredible €1200. Part of this money will be used for new play equipment for the yard this September (2014). Senior infants won the prize for the most amount of bob a jobs and will receive a small prize next week. Well done and thanks for all your support. Rinne Ellie ó Rang 5 blogáil as Gaeilge agus bhuaigh sí an 3ú háit i gcomórtas Seachtain na Gaeilge! Chomh maith le sin, fuair sí "Certificate of Commendation" don phictiúr a chuir sí isteach i gcomórtas Ealaíne Texaco! Huge congratulations to Ellie in 5th Class who received a "Certificate of Commendation" for her Cyber bullying themed painting in the Texaco Childrens Art Competition. Not only that, she has also won 3rd place in the Seachtain na Gaeilge competition for her Cyber Bullying blog! Our final ceremony in the "Do This In Memory" programme will take place this Sunday, 22nd June 2014 at the 12 noon Mass in the St John the Baptist Church. As it is the feast of Corpus Christi the children who received their First Holy Communion this year are invited to participate in the procession around the town, wearing their beautiful Holy Communion clothes. Meabhrúchán daoibh mar gheall ar an díolachán cácaí ar son UNICEF a bheidh á eagrú ag rang a ceathair amárach an 19.06.2014. Bheimis an-bhuíoch dá mbeadh tuismitheoirí / páistí in ann cácaí beaga (bunóga srl..) a thabhairt isteach don díolachán. Beidh cead ag na páistí iad a cheannach ar scoil ar an lá. Beidh costas €1 ar na cácaí. Just a reminder about the cake sale that fourth class will organise tomorrow 19.06.2014. We would be very grateful if children/parents could donate small cakes (buns etc.) for the cake sale. The children will be allowed to buy the cakes in school at the cake sale. Each cake will cost €1. Tá na múinteoirí socraithe don bhliain seo chugainn. Seo a leanas iad. Beidh an rang scartha ag fanacht scartha arís i mbliana. Múinteoir Tacaíochta Foghlaime roinnte le Scoil Chóbh an tSamhraidh - Maria Ní Iarlaithe. Ba mhaith liom fáilte buan a chur roimh Múinteoirí Siobhán Ní Bhruacháin agus Eavan Ní Chathasaigh a fuair postanna buana sa scoil ar deireadh thiar thall! Toisc go bhfuilimíd fós gafa leis an bpainéal ní féidir liom ainm an múinteoir eile a lúadh go fóill. Tiocfaidh athrú ar mhúinteoir Rang 1 i rith laethanta saoire an tsamhraidh ach déanfar gach iarracht claí leis an liosta mar atá sé thuas agus cuirfear ar an eolas sibh nuair a thárlaíonn an t-athrú. Má/nuair atáimíd ag fanacht ar an mhúinteoir nua beidh ár múinteoir Tacaíochta Foghlaime, Áine Ní Fhíobhra ag múineadh an ranga. Mar a deirim áfach, má ghlantar an painéal -mar atá súil againn leis - i rith na laethanta saoire déanfar an ceapacháin bliana agus cuirfear ar an eolas sibh chomh luath agus is féidir. Le gach dea ghuí an tsamhraidh! The teacher allocation for the 2014/'15 school year are as follows. The split class will remain split for this school year. I'd like to congratulate Múinteoirí Siobhán Ní Bhruacháin and Eavan Ní Chathasaigh who succeeded in securing permanent positions in the school. We are delighted and very lucky to have them. We are still tied to the panel and therefore there will be a change in the teachers as listed above as I cannot conclusively name Rang 1's teacher yet. Every effort will be made to ensure the rest stay as is. You will be informed when any changes are to be made. While/If we are waiting for the múinteoir eile the class will be taught by our Learning Support teacher, Múinteoir Áine. As I say though, if things change during the summer (and we hope they will with the panel) we will appoint our teacher for the year and you will be informed of the new arrangements as soon as possible. Fuaireamar cuireadh inniú chun páirt a ghlacadh i mbliots rugbaí áitiúl dos na hardranganna. Is dóigh liom go mbeadh sé deas do Rang 5 a bheith amuigh faoin aer arís agus ag meascadh leis na páistí ó na scoileanna eile áitiúla mar sin tá Rang 5 chun páirt a ghlacadh ann ar an Déardaoin an19ú Meitheamh 2014 ón 10-1. Beidh siad ag fáilt bus ann mar sin beidh costas €3 ar gach pháiste. Beidh siad thar nais in am don díolacháin cácaí! Brón orm faoi bheith ag lorg airgead uaibh chomh minic na laethanta seo ach tá na busanna san an-daor go deo agus níl an díolacháin cácaí riachtanach. Ba cheart ungadh gréine a bheith ar gach pháiste don bliots. We've been invited to participate in a senior classes rugby blitz. I think it'd be nice for the children to be out inthe air and also to mix with the other schools so I've agreed for 5th class to participate on Thursday 19th June 2014 between 10-1. They will be getting a bus there and back therefore it will be €3 per child. They'll be back at school just in time for the cake sale! I feel bad to be asking you all for money so regularly these days but the buses are expensive and the cake sale is for a good cause, but not essential. Every child should be wearing sunscreen and hats if possible for the blitz. Beidh Blitz Rugbaí ag Rang 5 ar an Déardaoin 19/06/2014. Beimid ag fágaint na scoile thart ar 9.30 r.n. agus teacht thar nais thart ar 12.00 i.n. Beidh costas €3 ar an mbus do gach páiste. Bíodh na héadaí spóirt scoile ar na páistí. Beidh siad thar nais i gcóir an díolachán cácaí! Go raibh míle maith agaibh. 5th Class will have a tag rugby blitz on Thursday 19/06/2014. We will be leaving the school at 9.30 a.m. approx. and coming back at 12.00 p.m. approx. There will be a cost of €3 per child for the bus. The children should wear their sports clothes. They will be back in time for the cake sale! Thanks very much. Gach Rang -Down's Syndrome "Fun Days"
Beidh uachtar reoite á fáilt ag na páistí ar son Siondróm Dún amárach, 18.06.2014, tar éis an la spóirt. Gnáth-bhloc HB le wafer a bheidh i gceist ann. Táimíd ag bailiú airgead don gcarthannacht san mar sin seolaigí isteach €2 an pháiste le bhur dtola. Seachas na Naíonáin Bheaga a bhailigh €53 ar son Barnardos don Toddle Mhóir. Nílimíd chun iarraidh oraibh €2 a sheoladh isteach arís! Ach gan amhras, má theastaíonn uaibh urraíocht a thabhairt is féidir! Tá an t-ádh dearg linn leis an aimsir iontach atá á fáilt againn faoi láithir ach tá sé go huile is go hiomlán riachtanach go bhfuil ungadh gréine le scáileáin árd, agus hata más féidir, ar gach pháiste ag teacht ar scoil gach lá faoi láithir. The children will be getting an ice-cream tomorrow,18.06.2014, after the Sport's Day. It will be the old fashioned HB block with 2 wafers. We're doing it in aid of Downs Syndrome Ireland Fundays so please send €2 in with the children except Junior Infants whose parents already donated a total of €53 to Barnardos for the Big Toddle! So we won't be asking you to contribute again to this, unless of course you wish to do so. It is for a good cause as always and the children do love an ice-cream on a hot day! We're so lucky with this amazing weather we're having! 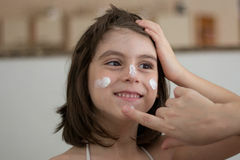 It's absolutely essential that every child has a high factor sunscreen on them every day now and a sun hat too, if possible. Mar is eol daoibh beidh lá spóirt againn amárach, Céadaoin 18.06.2014. Beimid amuigh faoin ngriain don lá ar fad. Mar sin tá sé an-tábhachtach go mbeidh uachtar gréine ar gach uile pháiste amárach. As you know, we will have our sports day tomorrow, Wednesday 18/06/2014. We will be out under the sun for the whole day. 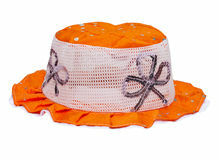 As a result, it is imperative that every child is protected from the sun with adequate suncream and hats if possible. Meabhrúchán daoibh mar gheall ar an díolachán cácaí ar son UNICEF a bheidh á eagrú ag rang a ceathair ar an Déardaoin seo an 19.06.2014. Bheimis an-bhuíoch dá mbeadh tuismitheoirí / páistí in ann cácaí beaga (bunóga srl..) a thabhairt isteach don díolachán. Beidh cead ag na páistí iad a cheannach ar scoil ar an lá. Beidh costas €1 ar na cácaí. Just a reminder about the cake sale that fourth class will organise on Thursday 19.06.2014. We would be very grateful if children/parents could donate small cakes in school at the cake sale. Each cake will cost €1. Tá sé i gceist ag na múinteoirí ranga na codanna mothálacha a chlúdach seachtain an 16ú Meitheamh 2014. The class teachers propose to cover the sensitive subjects on the week commencing 16th June 2014. An mhiste libh féachaint sa bhaile i gcóir léinte spóirt scoile a bhíonn á caitheamh ag na páistí do chluichí CLG. Tá uimhreacha 2, 3, 5 & 15 ar iarraidh ó léinte aois/tóise 10-11 AGUS uimhireacha 1 (-Cúl báire) 3, 4, 6, 7 agus 10 ar iarraidh ó aois/tóise 13. Táid an-chostasach le ceannach dá bhrí sin bheinn an-bhuíoch dá bhféachadh sibh tríd éadaí do pháiste le bhur dtola. Can I ask you all to have a look at home for some of our school GAA jerseys. From size/age 10-11 numbers 2, 3, 5 & 15 are missing and from size/age 13 numbers 1 (goalie) 3, 4, 6, 7 & 10 are gone walkabout! They are very expensive to replace so I'd really appreciate if you could look through your laundry and children's clothes. We'll be delighted to get them back as we understand they would be left at home in error. Súil agam go bhfuil sibh ag baint taitneamh as an aimsir álainn! Beidh an cluiche iománaíochta a chuireadh ar cheall an Aoine seo chaite (06/06/2014) ag dul ar aghaidh amárach (12/06/2014). Buachaillí R5 amháin atá i gceist anseo. Beidh an cluiche ar siúl i Shanbally ag a 10.30a.m. agus tá súil againn go mbeimid ar ais ar scoil ag a 12.00p.m. Tá síobanna eagraithe dóibh. Bíodh uachtar gréine, buataisí agus éidí spórt scoile orthu. The hurling blitz that was cancelled last Friday (06/06/2014) will be going ahead tomorrow (12/06/2014). It will be held in Shanbally at 10.30am for fifth class boys only. Lifts have been organised and we hope to be back in the school for 12.00pm. Please ensure that all boys have the appropriate gear, boots and sun cream. Blitz rugbaí amárach, Déardaoin 12.06.2014 ag Rang a 3 agus Rang a 4 sa Chlub Rugbaí ag a 10.00 a chlog. Beidh bus ag fágaint na scoile ag 9.45 r.n. Beidh na páistí thar nais ar scoil ar 12.45 i.n. Rugby blitz tomorrow, Thursday 12.06.2014 in Kinsale Rugby Club for 3rd and 4th Class. Bus leaving school at 9.45 a.m. The children should be back at school by 12.45 p.m.
Our final ceremony in the "Do This In Memory" programme will take place on Sunday, 22nd June 2014 at the 12 noon Mass in the St John the Baptist Church. As it is the feast of Corpus Christi the children who received their First Holy Communion this year are invited to participate in the procession around the town, wearing their beautiful Holy Communion clothes. Chomhghairdeas mór le Noah ó Rang a 1 a bhuaigh duais i gcomórtas ealaíne le Freddy Fyffe's. Maith thú Noah! Congratulations to Noah from Rang 1 who was highly commended for his entry in the Freddy Fyffe's Billboard art competition. Very well done Noah! Beidh díolachán cácaí á eagrú ag rang a ceathair ar an Déardaoin an 19ú Meitheamh 2014 ar son UNICEF. Bheimid an-bhuíoch dá dtabharfadh tuismitheoirí na scoile / páistí cácaí beaga istigh dúinn. Glacfaimid go buíoch le cácaí déanta ag an mbaile nó ceannaithe. Cácaí beaga (bunága) atá i gceist is beidh cead ag na páistí go léir iad a cheannach ar scoil ar an lá. Beidh ranganna na Naíonáin ar a dturas scoile ar an lá sin ach is féidir leo airgead a thabhairt isteach i gcóir UNICEF chomh maith má tá fonn orthu. 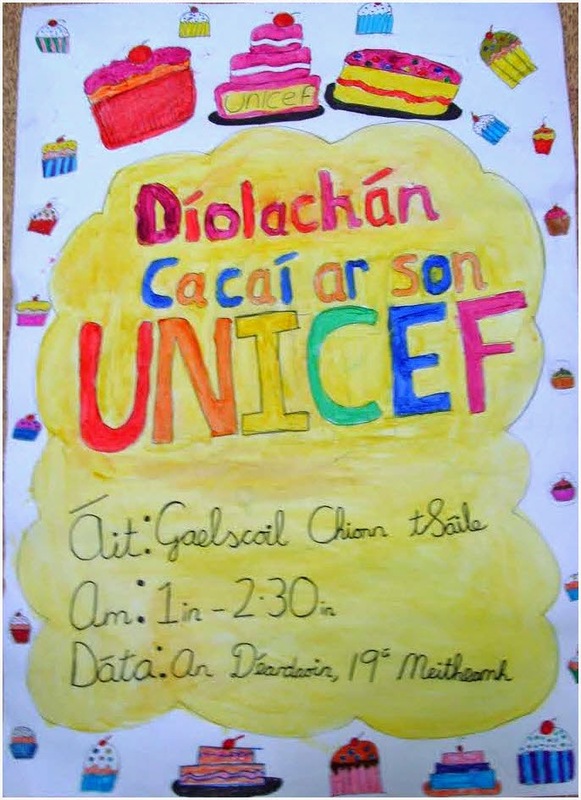 Fourth class are organising a cake sale in aid of UNICEF on Thursday, June 19th 2014. We would be very grateful if school parents / children could donate cakes, either homemade or bought. Small cakes (buns etc.) would be ideal as all children will have a chance to purchase the cakes in school on the day. Junior and Senior Infants will be on their school tour that day but they can bring in money also for UNICEF if they wish. Ba cheart go dtiocfadh na páistí ar scoil ins na héadaí a bheidh ag fáilt salach, ullamh le tosnú. Ba cheart an éide scoile spóirt a bheith sa mhála acu le athrú isteach ann tar éis na gníomhaíochtaí. Cuimhnígí go mbeidh orthu taistil ar bhus go dtí an áit mar sin seans go mbeadh "wet suit" tiubh an-the orthu. Is fúibh ata sé. The children should come to school dressed, and ready to start their outdoor activities, in clothes that will be getting dirty and/or wet. They should bring a dry school sports uniform to change into after the activities. Remember they will have to sit in a bus for a while to travel to the venue, therefore a thick wetsuit might be too warm and uncomfortable for this. Súil agam go mbeidh an-la acu! Tá cead ag na páistí 2 rud beag milis a bhreith leo ar an turas scoile amárach. Tá sé mínithe agam leo gan dul thar fóir leis na milseáin ach suas le 2 rud a thabhairt leo. Ní ghá gur milseáin ata i gceist ach briosca, bunóg, deoch. Pé rud a cheapann sibh a bheadh oiriúnach. Na seolaigí deochanna spraoi, guma cogainte nó pís-cnónna le bhur dtola. Ta Rang 4 & 5 ag iarraidh rudaí a cheannach ag na hinneal milseáin ag an Mardyke. Níl aon fhadb ró-mhór agam leis sin ann féin ach ná bíodh níos mó ná €2 acu. Má tá na hinneal briste nó má chailleann siad a gcuid airgid ní bheidh aon leigheas againn ar an scéal mar sin ní dóigh liom go bhuil sé ró-chiallmhar a bheith ag braith orthu áfach. The children may bring up to 2 small treats with them on their school tours tomorrow. I've been around and told them not to go over the top with the treats and to limit it to 2 small things for themselves, not for the class or anything like that! I'll leave the decision up to yourselves but a treat could be a biscuit, bun, scone, drink or whatever. Whatever you feel is appropriate. No chewing gum, fizzy drinks or peanuts please. 5th class seem to be particularly taken with the idea of buying their treats at the vending machines in Mardyke. I have no major concerns about this but no child should bring more than €2. If the machines are broken or they lose their money we won't be able to help them out in any way so I don't think they should rely on the machines for treats. Tá súil agam go mbeidh lá den scoth acu ar fad! Bhí na daltaí ag obair go dian sa rang Fraincise, Rang 5, i rith na seachtaine. Rinne siad Seo Faisin as Fraincis an tseachtain seo caite. Rinne siad cur síos ar a n-éadaí as Fraincis. Thug siad cuireadh don Rang 4 agus Rang 3 agus bhain siad árd -taitneamh as. Comhghairdeas Rang 5! Bhí a gcuid oibre ar fheabhas ar fad! Táimid go léir bródúil astu! Children of rang 5 organised a French fashion show as part of their French class on 26th May 2014. The children designed their outfits and described them in French. They invited rang 4 & 3 to the show which was a real success. Well done to all of them for their work and their impressive French. We are very proud of them. Tá Rang a 1, Rang a 2 agus Rang a 3 ag glacadh páirt i mblitz peil gaelach Dé Luain, 09/06/14 i bPáirc C.L.G. Chionn tSáile. Beidh Rang a 1 agus Rang a 2 ag siúl chuig an pháirc ag a 9 a chlog ar maidin ón scoil agus siúlfidh siad ar ais ag a 12 a chlog. Beidh Rang a 3 ag siúl chuig an pháirc ag a 11 a chlog ón scoil agus siúlfidh siad ar ais ag a 2 a chlog. Támid i ndiaidh an €3 a choimead ón uair deireanach a cuireadh ar ceall é, mar sin na daoine nár thug é fós, tabhair é ar an Luan le bhur dtola. Le bhur dtola bíodh stocaí le spáráil acu mar beidh an féar fliuch. Rang a 1, Rang a 2 and Rang a 3 are participating in a football blitz this Monday, the 09/06/14 at Kinsale GAA pitch. Rang a 1 and Rang a 2 will walk to and from the pitch, leaving the school at 9 o clock and returning at 12 o clock. Rang a 3 will walk to the from the pitch, leaving the school at 11 o clock and returning at 2 o clock. Please contribute €3 per pupil. We have an account of those of who have already paid the €3 the last time when it was postponed. The pupils can wear football boots if they have them but they are not a necessity. Gum shields are now a necessity for all underage gaelic football games so we recommend that your child wears them tomorrow. However, do not worry if your child doesn't yet own one, they will still be allowed to play without them. Please pack spare socks as the grass will be wet. Uachtar na gréine/Suncream if sunny! Tóg do pháiste go dtí an O.E.C. ar 9.15 r.n. / Please drop them off at 9.15 at the O.E.C. Bailigh do pháiste ar a 4 i.n. ag an O.E.C./ Please collect them at the O.E.C at 4 p.m.
Leigheas pearsanta más gá agus labhair le m. Eavan/Siobhán Ní Bh./ Personal medication, if any and explainto M. Eavan/M. Siobhán Ní Bh. Beidh Blitz iománaíochta Sciath na Scol i gcóir rang a 5, ar siúl amárach, Dé hAoine, 06/06/2014. Beidh sé ar siúl i Shanbally oná 11.45am go dtí 2.15pm. Ba cheart go mbeimis ar ais ag a 3.00pm. Tá síobanna eagraithe againn. Má tá aon cheist ag éinne mar gheall air, tar chugham roimh 8.50am maidin amárach, 06/06/2014. A Sciath na Scol hurling blitz for 5th class, will be held tomorrow, Friday, 06/06/2014. It is to be played in Shanbally from 11.45am to 2.15pm. We should be back in the school for 3pm. Lifts have been organised. If there are any questions, please do not hesitate to ask me before 8.50am tomorrow morning, 06/06/2014. Seo daoibh na liostaí leabhar le cheannach i gcóir 2014/2015. Tá na leabhair ar fáil ó Liam Ruiséal, 49/50 Oliver Plunkett St. Cork. (021 4270981, sales@Irbooks.net) ACH AMHÁIN an SALF agus JOLLY PHONICS. Tá na leabhair seo ar fáil ón scoil. Mar is eol daoibh beidh siopa Liam Ruiséal sa scoil ar an Déardaoin 12ú Meitheamh 2014, 5 - 7 i.n. agus beidh sibh in ann na leabhair a cheannach ansin. Beidh Hilda ann ag díol SALF agus JOLLY PHONICS. Liosta praghasanna na leabhair iniata. Na déan dearmad, áfach, go mbeidh an bille scoile fós le híoc agaibh le leabhair ar cíos, costas fotocóipeáil, árachas srl in áireamh. Beidh an costas seo cóngarach a dhóthain don mbille scoile a bhí agaibh annuraidh. Here are the book lists to be purchased for 2014/2015. All the books are available at Liam Ruiséal, 49/50 Oliver Plunkett St., Cork (021 4270981, sales@Irbooks.net) EXCEPT SALF and JOLLY PHONICS. These books are supplied by the school. As you know Liam Ruiséal will set up a shop in the school on Thursday 12th June 2014, 5 - 7 p.m. and you will be able to buy the books then. Hilda will sell the S.A.L.F.s and JOLLY PHONICS there also. Liam Ruiséal's price list is attached. Don't forget, however, that you will still have to pay the school bill. This includes books for rental, photocopying cost, insurance etc. This expense will be close enough to last year's school bill and will be sent out to you shortly. 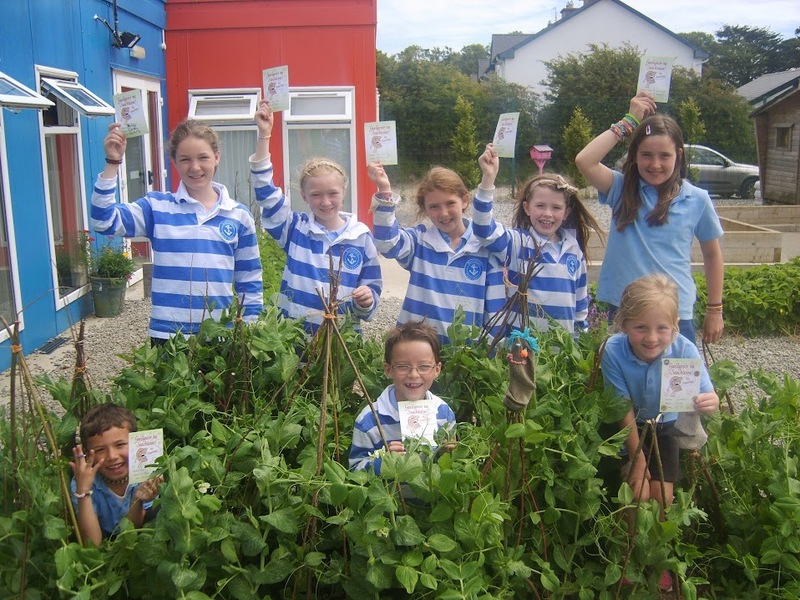 Tá cabhair ag teastáil ó rang na Naíonáin agus Rang 4 ar lá na dturasanna scoile (Dé Máirt 10ú Meitheamh 2014). Beirt duine in iomlán ag teastáil. Má tá tú ar fáil chun teacht linn go Fóta nó go dtí an Mardyke tabhair d'ainm do Hilde. Go raibh maith agaibh. Junior Infants and 4th class need some help on the day of the school tours (Tuesday 10th June 2014). Two people needed in total. If you are available to come with us to Fota or to the Mardyke, please give your name to Hilda. Thank you. Beidh rang na Naíonáin bheaga ag glacadh páirt i Toddle Woddle ar an Aoine bheag seo, an 6ú Mheitheamh 2014 ar son Barnardos. Beimíd ag siúl ón scoil go dtí an chrosaire ag Bóthar Droichead ns mBandan. Táimid ag lorg €2 ó gach pháiste in ionad iad ag bailiú deontaisí agus ag líonadh suas cárta bailiúcháin. 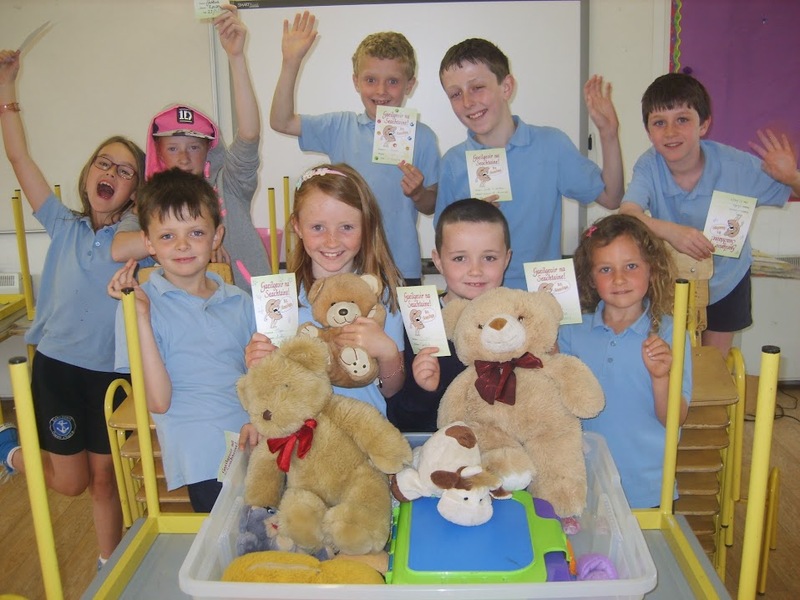 Junior Infants are participating in a Toddle Woddle this Friday, 6th of June 2014 in aid of Barnardos. We will be walking from the school to the Bandon Road cross. 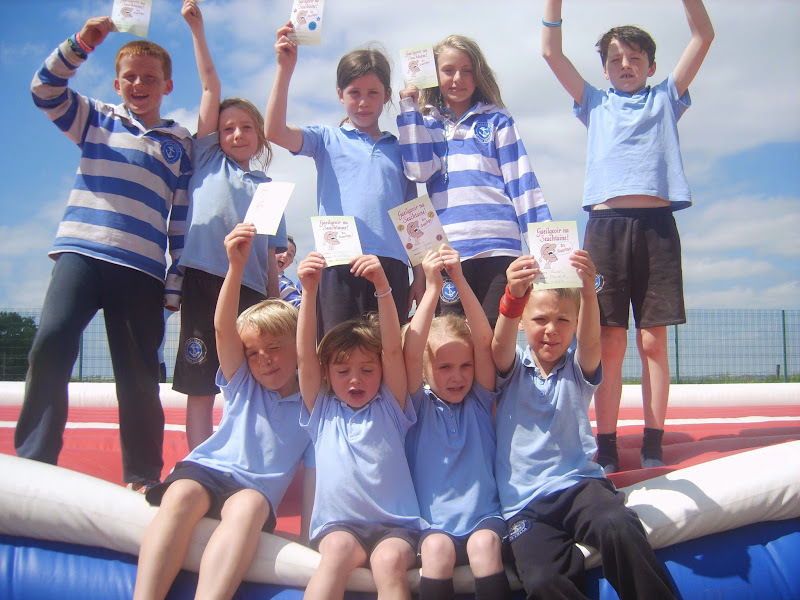 We are looking for €2 from each child instead of lthem ooking for sponsorship and filling up cards.